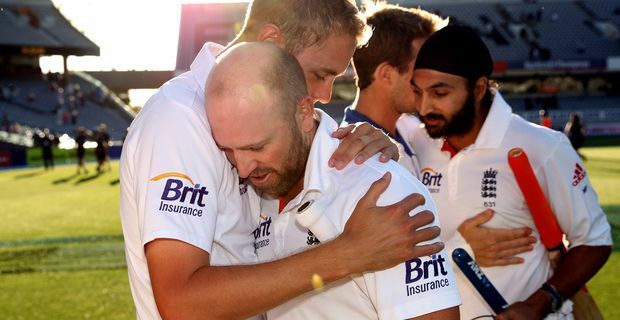 Exemplary wicket-keeper, aggressive batsman and selfless team player Matt Prior has been named the England cricketer of 2012-13. Consistent excellence in Tests made the modest Prior the obvious candidate for the honour, even if the player was reluctant to step into the spotlight. "It's a huge honour to be singled out as the player of the year," Prior said, "but I feel slightly uncomfortable about it because the individual accolades aren't why I play. I play to win and get much more out of the group winning a Test match or a series." This selflessness is a characteristic of Prior who, unlike some players (ahem, Kevin Pietersen) always puts the team cause ahead of his own statistics. "Any time I go out to play an innings the first thought is 'OK, where do we need to be to be in the best position to win a game and what do I need to do to get the scoreboard in the right place?' rather than 'how many runs do I need to average 50?'" In this England side, Prior is often asked to go out and bat aggressively to increase the run rate. His most impressive display in the last year though asked him to do the opposite. England had to bat a day and a half in Auckland to save the final Test, and the series, against New Zealand. Prior blocked everything the Kiwis threw at him and was unbeaten until the end, amassing a steady 110 before being hugged by relieved and grateful team-mates. It was one of the most impressive English innings in recent memory, although Prior even tries to play that down. "I got a huge amount of plaudits simply because I was there at the end," he said. "Ian Bell played an unbelievable innings that day; to face almost 300 balls and take so much time out of the game. Stuart Broad – I've never seen Broady play that long without getting off the mark or playing a shot in anger." Prior's consistent excellence and professionalism will be among England's strongest assets as they begin the return Test series against New Zealand at Lord's.